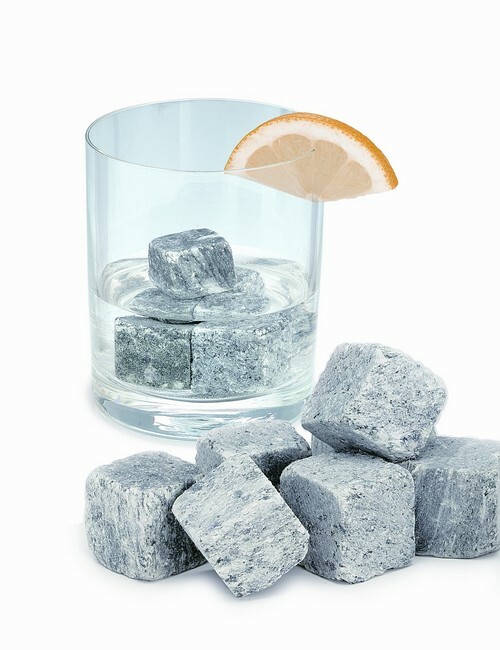 Now when you order a drink on the rocks you can literally serve up the real deal to your taste buds. Nordic Rock is mined from ancient Swedish pollution-free base rock. It is the purest way of cooling your drink - literally 'on the rocks'. Stone does not melt, which means no unclean water in your glass. They are also reusable making them very eco-friendly. To use, simply place the stone ice cubes in the freezer for approximately one hour before use. For a normal glass, two or three Nordic Rocks will be fine. They give off their cold gradually and equally. For maintenance, rinse your stones under clean water and store them in the leather pouch provided. They are then ready to serve you again any time to your fullest satisfaction.